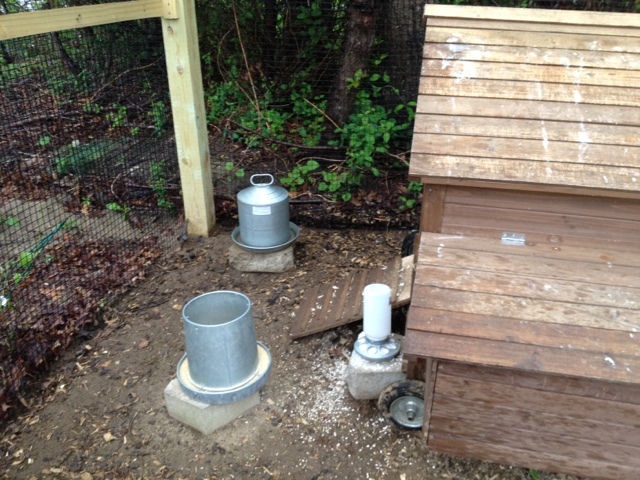 With more chickens arriving this spring, I’ve been reassessing our current housing. 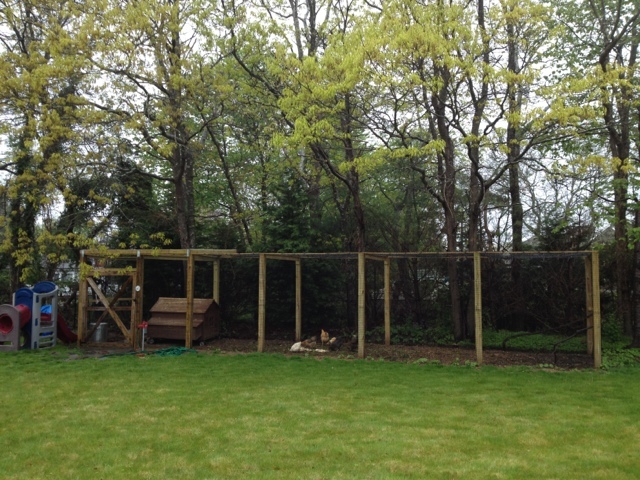 Prior to blogging about our mini farming adventures, we purchased a chicken coop advertised to hold 16 birds and built a run accordingly with 20 square feet per chicken (8’x40′) so they would have plenty of room to be happy chickens when they aren’t free ranging. We are quite proud of the run. It is a sturdy construction, fully enclosed in hardware cloth, which is also partially buried underground. Needless to say, we’ve never had a predator problem inside the run. It’s a Fort Knox. My husband even installed a corrugated roof over the coop and food so the ladies and I would have a dry spot while doing our daily chores. And then there is the coop itself. It was purchased online cheap, site unseen, in kit form. All I can say is that we got what we paid for and I regret not making a better investment or building it ourselves. On the positive side, the chickens love the nesting boxes and will even come back from free ranging to lay eggs inside them. On the negative side, the chickens hate the coop. 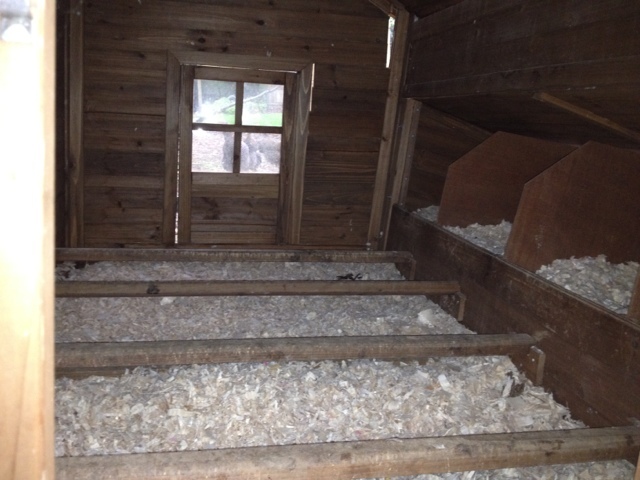 “Really,” you say, “How can nice chickens hate a nice coop.” “Well,” I reply, “They refuse to use it.” What??? Since introducing them to the coop and allowing them to come home to roost, they have chosen instead not to roost on the roosts. Instead, they sleep on top of the roof. The roof??? Yup, they clumsily fly up to the A-frame roof and sleep like ducks in a row. Fortunately, we had an extremely mild winter, but I am concerned for what next year brings. So below are some photos of what works and what needs improvement. 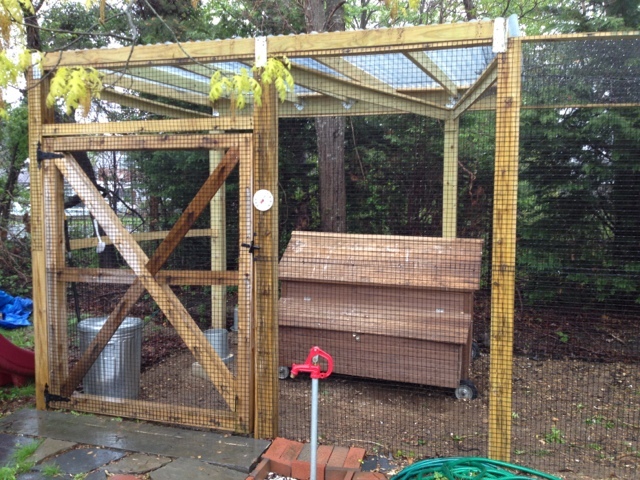 Here’s our chicken run and coop. It’s situated to be sunny in the winter and shaded in the summer and so we can watch the chicken antics from the house. The run measures 8′ wide because that was the width of the hardware cloth. 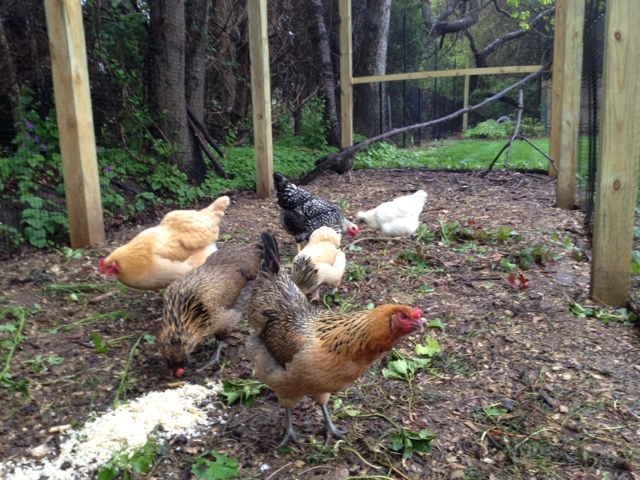 There’s plenty of room and plenty of room makes for chickens that are nicer to each to other. This is a closer look at the corrugated roof that my husband added after our birdbrains decided to sleep under the stars. As an added bonus, it is a real plus for making chores easier when it’s raining or snowing. We sometimes in poor taste jokingly refer to it as the “favelas” in reference to the poor shantytowns of Brazil. My Portuguese-American husband tells me that the word “favela” is actually derived from the Portuguese word for fable or fairytale so I’d like to think our set-up is closer to the latter meaning. Underneath the corrugated roof we have the food, water, free-choice calcium, and a galvanized metal can with lid for storing extra food and supplies. 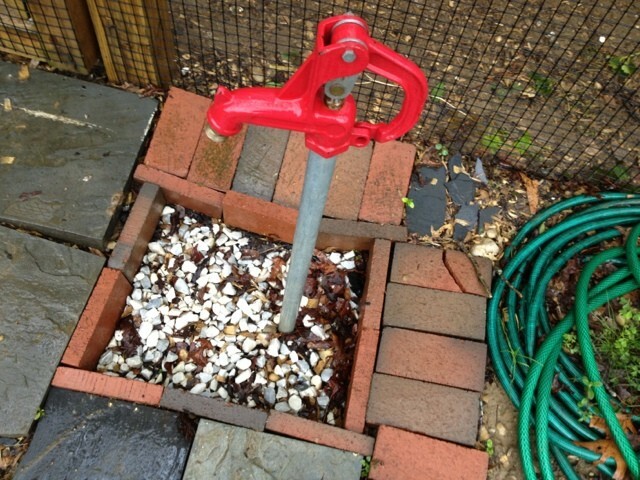 Ahh, here’s the most convenient part of our arrangement: Running water from a frost-proof hydrant. This is also doubles as the water source for my mini farm plot. 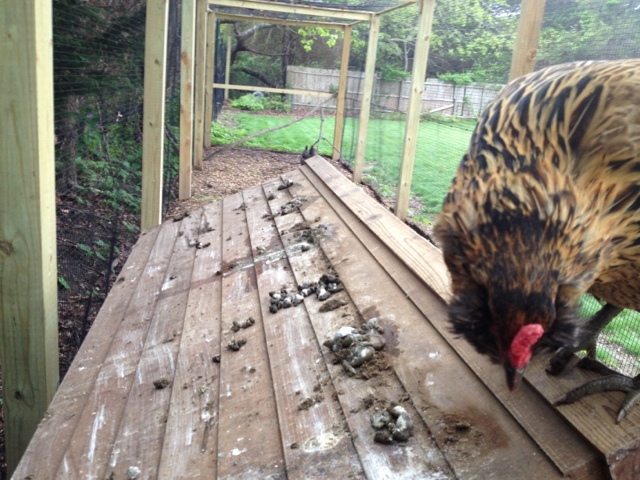 Why my chickens hate the coop: I think the roosts are too close to the ground and they prefer to be higher up. Yet perhaps I should be grateful the chickens prefer to sleep outdoors? One evening after sweeping, the roof is again covered in chicken poop. Backyard Poultry magazine had an interesting article about how fresh air is so much healthier and this arrangement certainly fits that description. Why I hate the coop: It started falling apart shortly after assembly. The nesting boxes are precariously drooping and the walls are coming undone. Because it is constructed of such poor quality materials, it is resisting our preservation efforts. I thought the removable floor trays were a grand idea, but in practice they get jammed with litter. So I must remove all the litter through the little pop hole prior to removing the trays for washing. Doesn’t that defeat the purpose? Once this coop does finally fall apart, I think I want to build a coop that employs the deep liter method. 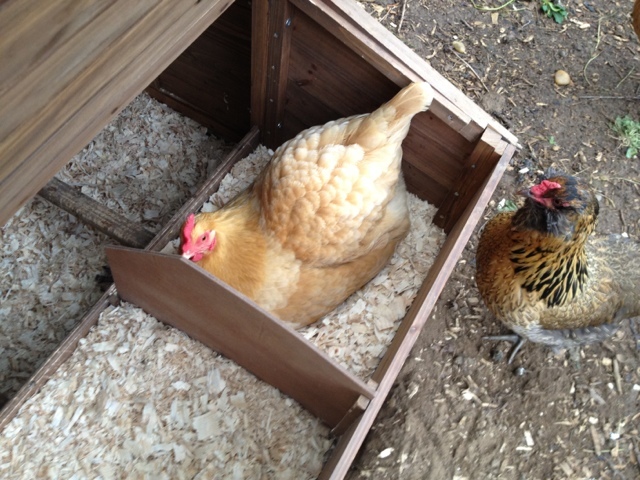 Fortunately, the ladies do love their nesting boxes! Roughly in order of the pecking order, our mixed flock has a treat inside the run. 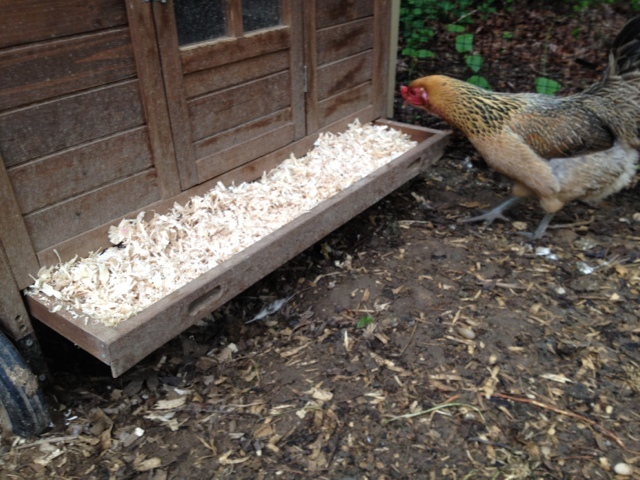 Reduce, reuse, recycle… Waste not want not… Besides, have you seen the prices of chicken coops lately?! My Faverolles eggs arrive soon and I’ve been mulling over how to best integrate them into our existing flock whilst simultaneously improving the housing quality for all of our birds. 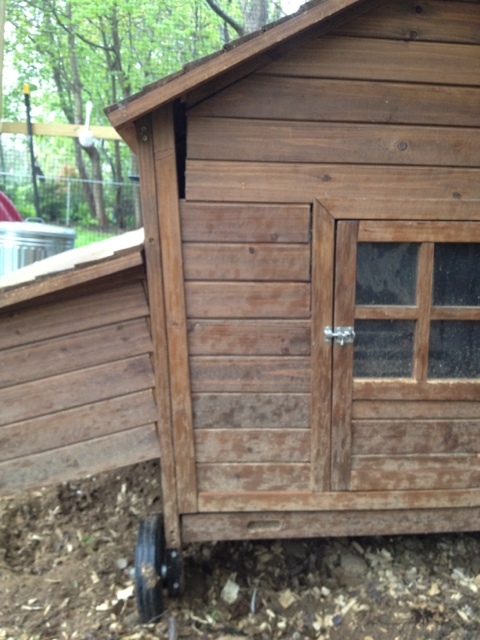 So I’m setting myself a personal challenge: Build a new coop from reclaimed materials… primarily from abandoned pallets. I’m going to start with a stepping stone project: A small mobile chicken tractor with the dual purpose of brooder and isolation space in case of injury or illness. I figure I have about 42 days (Another week until the eggs arrive, 21 days in the incubator, plus two weeks that the chicks will fit comfortably in their brooding quarters). Now for the biggest part of the personal challenge: I need to overcome my healthy respect (i.e. fear) of sharp power tools. And even more importantly: I need to keep my toddler safe from said tools. Does anyone have any ideas about pallet coops? I’d really appreciate any feedback, links, and/or pics!